This week’s Beer Sessions Radio is live from Jimmy Carbone’s bar, Jimmy’s No. 43! 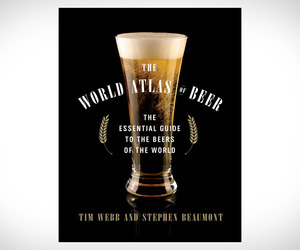 Guests on today’s show include the authors of The World Atlas of Beer, Tim Webb and Stephen Beaumont, and Chimay ambassador, Luc “Bobo” Van Mechelen. Tune in to hear about Bobo’s storied history in the beer world, and why Chimay has been so successful in the United States. Tim and Stephen discuss their reverence for famed beer writer, Michael Jackson, and how their book was influenced by his writings. Bobo and Tim talk about lambics, and what beers can be officially labeled with the title. Hear the gang’s opinions on Italian beers, and listen in to hear about some European countries with burgeoning beer scenes! Learn more about beer in South America, Asia, and Africa! This episode has been sponsored by GreatBrewers.com.